The EGO impressed me with its cutting speed and long trigger. I suggest a couple of improvements for future models but this still is near the top of the heap! All other things equal, battery-powered tools are preferable to gas-powered tools. Consider this – you don’t have to keep gas that’s flammable and spillable on hand, you don’t have to mess around with mixtures on two strokes or add oil to four strokes, don’t have to clean the air filter, you don’t fiddle around with primer bulbs and pull-starts, and there is no spark plug to foul. Although other things are rarely equal, battery technology has improved so much over the last few years that nearly all tool categories now have a battery-powered alternative that approaches or even exceeds the capability of the gas-powered version. Today I have the opportunity to see if that holds true with the 16-inch EGO Chainsaw, model CS1604. As a relative newcomer to the industry, EGO has quickly established itself as an excellent OPE manufacturer. In fact, they’re the ones that really blew the doors off in this battery-fueled revolution. Kitted with a 5.0 Ah battery, this update from the original EGO Chainsaw looks promising enough. It features a 16-inch Oregon bar and a 3/8-inch, Oregon 90 chain with 0.043-inch thick drive links. It boasts a brushless motor, tool-free adjustments, chain kickback brake, tensioning knob, oil inspection window, and an automatic lube system. There isn’t an electronic safety, which isn’t necessarily standard on battery-powered chainsaws but it certainly doesn’t hurt to have one. Instead, it has a mechanical two-step trigger with a thumb safety. The bucking spikes – more like bucking ridges – have a small profile and are made of plastic, so that’s a bit worrisome. But let’s give it a fair shake. It’s always wise to inspect a tool before each use – even the first use – for general care and maintenance. In the case of chainsaws, you must confirm that it has sufficient bar and chain oil or you won’t make the first cut and might damage the saw. I opened the EGO’s oil cap and found a plastic filter at the inlet. Not a bad idea to keep debris out in the field, but it made filling the tank with thick bar and chain oil difficult by effectively making the inlet diameter too small. Additionally, the cap threads aren’t precisely aligned so I found the cap cross-threaded easily. Fortunately, the EGO Chainsaw Model CS1604 got much better from there. It even began to outshine some of its competition in some ways. For performance, we tested cutting speed and runtime with the included battery. We go into much greater detail about the testing methods and other data we extrapolated in the shootout article. Check out how the 16-Inch EGO Chainsaw did against the competition in our shootout! When you’re cutting with a chainsaw horizontally, you use a felling grip (to fell a tree.) The EGO saw rated Very Good in this hold. When the cut is made vertically as most cuts outside the forest are, it’s called bucking grip. The bucking spikes are designed to grasp the log and provide a more secure bite. Even with plastic ridges instead of metal bucking spikes, the overall grip comfort and balance still gave it a good rating for the bucking grip. Only two of the eight saws in the competition were able to cut through an 8-inch pine log in under 6 seconds, and one of them was the 16-inch EGO Chainsaw at 5.76 seconds. Its 5.0Ah battery produced an excellent 91 cuts, although the number of cuts per nominal watt-hour (AKA fuel efficiency) was on the lower end. Overall the saw is well-balanced. The trigger is a standout feature among in this chainsaw group because it’s very long, allowing the user more grip variation. In the end, the EGO placed 3rd in our shootout and proved itself to be among the best-value of the eight chainsaws in the group. The EGO saw is close to being on par with the winner as it posted equal and sometimes better runtimes and cutting speed times during some of the preliminary trials – but mostly in in smaller cuts in the 5- to 6-inch range. 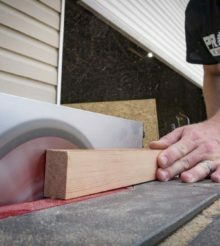 Its design is a bit different than other saws with its long rear handle arching above the port for the saw’s huge battery which slides in from the side. However, its unique form factor was not a detriment. It didn’t rate quite as high as the top saw in ergonomics, but it wasn’t unwieldy either. Pros include an extra-long trigger that allows for a varied grip stance on the extra-long rear handle. Cons include a tensioning dial that was more difficult to grip and turn than the other tool free adjusters—especially with gloves on, an oil tank that was difficult to fill with its filler neck filter restricting the opening, and a vague and unreliable battery fuel gauge that lights red for empty and green for good, but sometimes lit green even when depleted. This chainsaw is an all-around solid performer despite some of the cons. Kitted at $299 and a 5-year warranty at The Home Depot, it’s one of the better values available.